ABERFELDY COTTAGE HOSPITAL, Old Crieff Road The building is dated 1909 and opened on 27 October 1910. It was erected under the auspices of Sir Donald Currie of Garth on a site granted free by the Marquis of Breadalbane. It was designed by Dunn & Watson to blend in with the local architecture, being single-storey, white-harled with crowstepped gables and green slate roof. ATHOLE AND BREADALBANE POORHOUSE, LOGIERAIT The poorhouse at Logierait was designed in 1861 by J. C. Walker, a specialist in the design of such institutions. 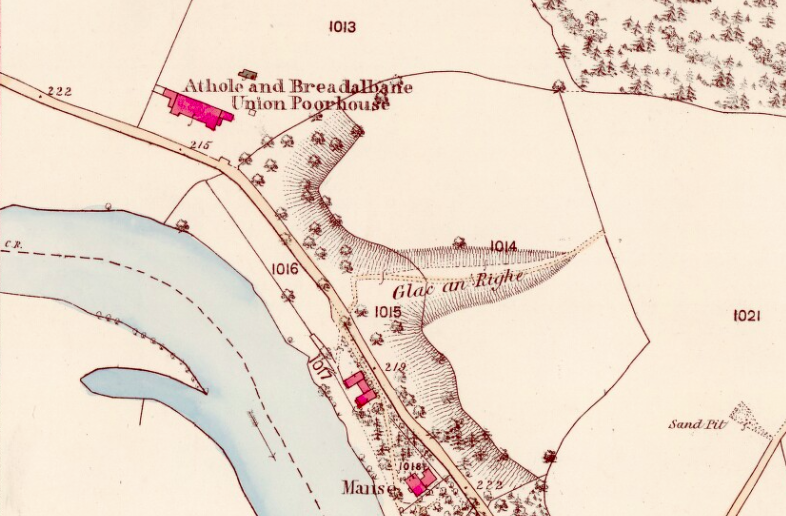 He was the architect for the poorhouses for Galashiels (1859), Dysart (1860), Dumbarton (1862), Auchterarder (1862, see Strathearn Home below) and Islay (1865). He also designed Waverley Hydrophathic Institution near Montrose, an early concrete building, erected in 1869-71. BLAIRGOWRIE COTTAGE HOSPITAL, Perth Road The Blairgowrie and Rattray District Cottage hospital was built in 1901, at a cost of £2,643, to designs by L. & J. Falconer. In 1940 the Dr Hood and Dr Shaw Memorial Wing was added, providing a further eight bedrooms and staff accommodation. BRIDGE OF EARN HOSPITAL (demolished) One of the seven new Emergency Medical Scheme hospitals constructed in Scotland during the Second World War. It opened in 1940 with 1,020 beds. The original expectation was for these EMS hospitals to take civilian casualties, but as these did not occur in the early stages of the war, initially patients came from nearby military camps. Bridge of Earn also took patients evacuated from general hospitals and TB cases. At times, prisoners of war here were also accommodated here. 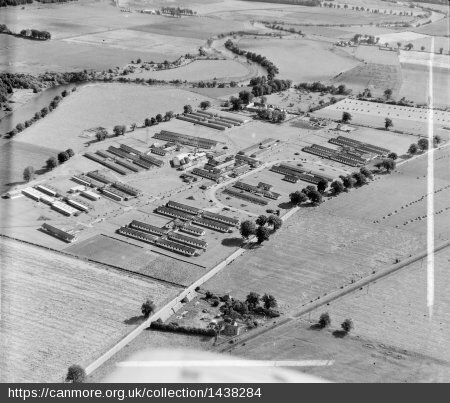 In 1946 the war-time rehabilitation unit set up at Gleneagles Hotel was transferred to Bridge of Earn, and the following year the orthopaedic unit from Larbert moved here. The hospital was transferred to the National Health Service after its inception in 1948. In 1990 the hospital still presented much of the character of its original appearance although the hutted ward blocks had been refurbished. BUCHANAN HOUSE OF RECOVERY, HATTON ROAD, NEW RATTRAY This small convalescent home was established by Emily Octavia Buchanan, in memory of her husband, Thomas Ryburn Buchanan, M.P. and former Under secretary of State for India, who had died in 1911. It was built in 1915. The plans were drawn up by the local architect Lake Falconer (though whether the father or son is not clear, the father had supposedly retired but the son was serving abroad in the Royal Artillery), in consultation with Reginald Fairlie, Mrs Buchanan’s nephew. Fairlie’s influence is apparent in the Arts & Crafts detailing, such as the swept slate roofs. It was built of red Locharbriggs freestone and square rubble from a nearby quarry. The south elevation features a central gable and the flanking wings have stout verandahs where patients could sit out but still be sheltered. There was accommodation for male and female patients on the ground floor and staff in the attics. 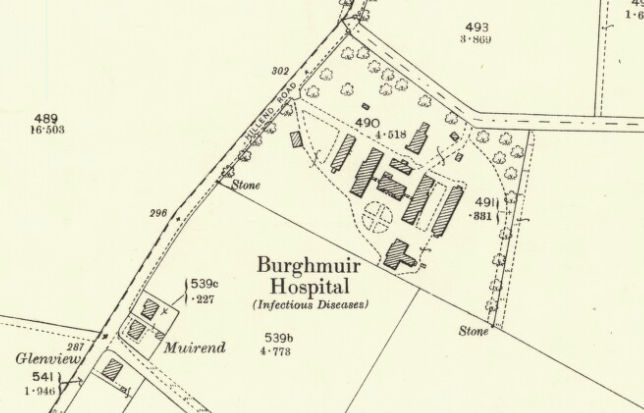 BURGHMUIR HOSPITAL, HILLEND ROAD, PERTH Built as the county infectious diseases hospital Burghmuir Hospital. 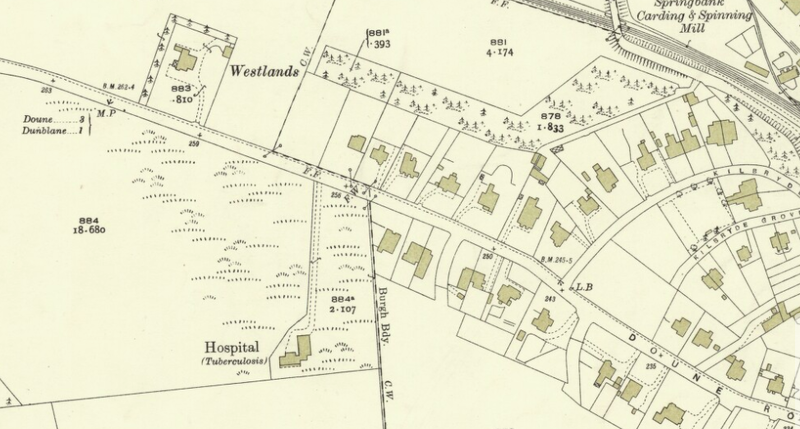 The land had been acquired by 1898, and two portable hospital buildings erected on the site. In 1899 these were filled to capacity with scarlet fever cases. The medical officer of health for Perth recommended the addition of a ward block by Speirs & Co with 20 adult beds (or 40 for children), an admin block and outbuildings. In 1911 it was enlarged with ward accommodation for a further 34 beds and a new administration block was built. CRIEFF COTTAGE HOSPITAL, Pittenzie Street (demolished) A competition was held for the design of this cottage hospital which was won by Edward Maidmen in 1906. Maidmen had won the competition for Moffat Cottage hospital the previous year, and had designed numerous hospitals in his career, having gained early experience in hospital design working with Frederick Wheeler and Henry Saxon Snell. The hospital closed in 1996, and has been replaced by a community hospital in King Street, which opened in 1995. The former hospital was demolished and Glenearn Court, sheltered housing for the elderly, erected on the site. DUNBLANE HOSPITAL FOR CONSUMPTION, DOUNE ROAD (demolished) A small wood and iron hospital was opened in 1909, but seems to have been replaced by a more substantial building off the Doune Road in the 1920s. By the late 1930s it was being used as a youth hostel, and continued as such until the 1960s or early 70s. It was then demolished and the area developed for housing. DUNBLANE HYDRO The Hydro opened in 1878. It was built at a cost of around £60,000 to designs by Peddie & Kinnear. The first resident medical officer was a Dr Clark who supervised a range of hydropathic treatments. By the late 1890s it had been acquired by Andrew Philp, who had also taken over the Glenburn Hydro, Rothesay. Philp advertised a range of luxurious facilities indoors and out, from billiard rooms and a ladies’ writing room to a golf course, bowling green and tennis courts. It also offered an extensive range of water treatments with a small swimming bath, as well as Russian, Turkish, plunge, douche, needle, spray, sitz, vapour, medicated and pine baths. Advertisement for the Dunblane Hydro from the Post Office Directory for Dundee of 1893-4. Reproduced under Creative Commons Licence CC BY-4.0 courtesy of the National Library of Scotland. During the First World War the hydro was requisitioned by the War Office for use as a military hospital. 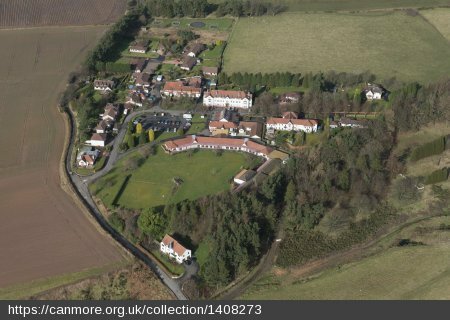 During the Second World War it was used to re-house evacuated pupils from a girls’ boarding school and as a convalescent home for soldiers (not at the same time). The hydro is still operating as a luxury hotel. 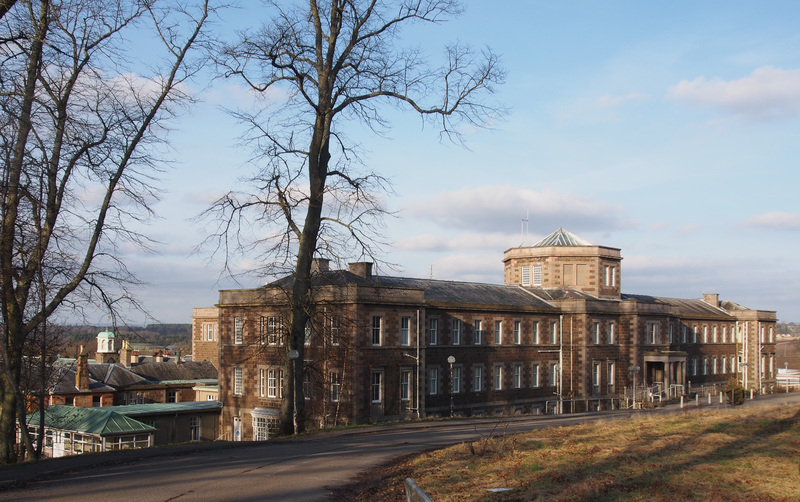 After the hospital closed, the site was taken over as a Borstal Institution, latterly Friarton Hall Young Offenders Institution, serving as an annexe to the main prison. It closed in 2010. The buildings have now been demolished to make way for a housing development. FRIARTON SMALLPOX HOSPITAL, PERTH A smallpox hospital was erected by the river at Friarton by the Police Commissioners around 1881, perhaps in response to an outbreak of the disease in 1878. GLENLOMOND HOSPITAL, KINROSS Glenlomond Hospital was built as the TB sanatorium for the joint counties of Fife and Kinross, by Alexander C. Dewar of Leven, opening in 1919. It was built on a hill-side site overlooking Loch Leven. When the need for such sanatoria declined it was converted for use by mentally handicapped and psycho‑geriatric patients. After the closure of the hospital in 1987 the site was developed as private housing. HILLSIDE HOSPITAL, Dundee Road, Perth (demolished) Originally founded in 1876 for incurables, it moved to this site in 1883, and became known as Hillside Home. and in 1888 a building was provided for patients suffering from consumption. Extract from the second edition, 25-inch OS map, surveyed in 1900. Reproduced by permission of the National Library of Scotland. 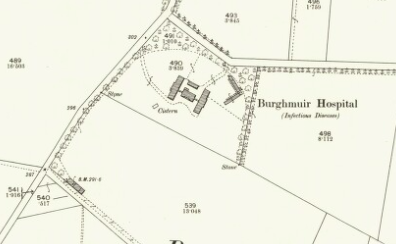 In 1901 Barnhill Sanatorium was opened. This was probably the building referred to in 1898 in The Builder as a new hospital for consumptives to be built in connection with Hillside Hospital to designs by John Murray Robertson. Extract from the 6-inch OS map, published c.1933 . Reproduced by permission of the National Library of Scotland. In 1908 the villa adjacent to Hillside was purchased and converted for the treatment of phthisis (TB). The hospital was maintained by public endowment and subscription and mainly took paying patients with some ‘deserving cases’ being admitted free of charge. Further extensions were carried out to the south in 1928, by Heiton & McKay, and to the north in 1932 by Smart, Stewart & Mitchell. Extract from the second edition, 25-inch OS map, revised in 1931. Reproduced by permission of the National Library of Scotland. IRVINE MEMORIAL HOSPITAL, PITLOCHRY The Irvine Memorial Nursing Home was built in 1901 as a memorial to Dr William Stewart Irvine, a medical practitioner who had practised in the district for nearly 60 years. It was designed in 1900 by John Leonard in an unassuming manner. The parish district nurse became the first matron of the cottage hospital. Stobie’s map of Perth, 1783. Reproduced by permission of the National Library of Scotland. Extract from the 1860 OS Town Plan. Reproduced by permission of the National Library of Scotland. KINROSS INFECTIOUS DISEASES HOSPITAL, Gallowhill Road (demolished) This small local authority isolation hospital was of the temporary wood-and-corrugated iron type, often provided by Speirs and Company. It ceased to function as a hospital around the 1950s when it became a youth hostel, Michael Bruce Hostel named after the celebrated local poet. MEIGLE COTTAGE HOSPITAL The hospital opened c.1911 and was built and endowed by Mrs Edward Cox, of Cardean, in memory of her husband. Built of red brick and harl with a red‑tiled roof, it has a two‑storey central block with a canopied verandah between the projecting single‑storey ward wings. 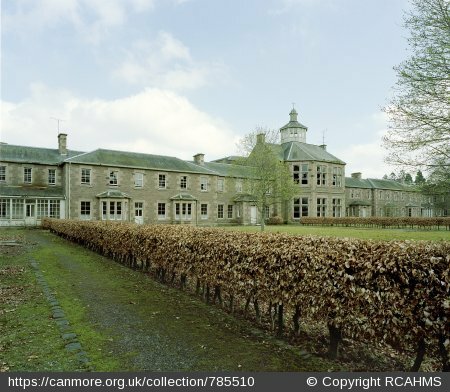 The hospital closed in 1994 and was converted into a care home, called Meigle Country House. Originally it had accommodation for 80 patients, officials and staff. In 1833 Burn added a wing to the north. In 1848 Pitcullen House (formerly Pitcullen Bank) was acquired and fitted up for ‘higher class’ patients. Extract from the first edition, 25-inch OS map, surveyed in 1860. Reproduced by permission of the National Library of Scotland. In 1864 the spiral stair was removed from the octagonal tower and a cupola placed on the roof. In the same year a house was built for the physician superintendent. A lodge was built at about the same time for the head male attendant. Extract from the second edition, 25-inch OS map, surveyed in 1899-1900. Reproduced by permission of the National Library of Scotland. In 1888 new infirmary wings were added to the rear of the main building. At the turn of he century two new villas and a chapel were built. The villas were designed by Maclaren and Mackay and have applied half‑timbering. They were completed in 1902. Between these was the chapel, a distinctive building on the site, the lower walls were constructed of whinstone rubble with red sandstone above. The rubble work on the tower is of an exaggerated random form and is capped by an octagonal cupola. It was designed by the physician superintendent Dr Urquhart, who maintained an interest in architecture. Murray Royal © Copyright Lis Burke and licensed for reuse under this Creative Commons Licence The chapel and flanking villas, photograph taken in 2005. These buildings were empty and boarded up in 2013. Gilgal was opened in 1930, intended for voluntary patients. It was designed by Smart, Stewart and Mitchell of Perth. It is a surprisingly old-fashioned style, harking back to the Scottish Arts & Crafts manner of Robert Lorimer in the Edwardian era. In 1939 a new nurses’ home was opened to the west of the original block and stark by contrast (gentle Art Deco, according to John Gifford in the Pevsner Architectural Guide). It was also designed by Smart, Stewart and Mitchell. MURTHLY HOSPITAL Built as the Perth District Asylum, it was designed by Edward & Robertson, of Dundee and opened in 1864. It was the second district asylum to open in Scotland. Five architects submitted plans from which the Dundee architects were chosen. David Smart designed the Italianate administration block at the centre. Extract from the first edition, 25-inch OS map, surveyed in 1864. Reproduced by permission of the National Library of Scotland. 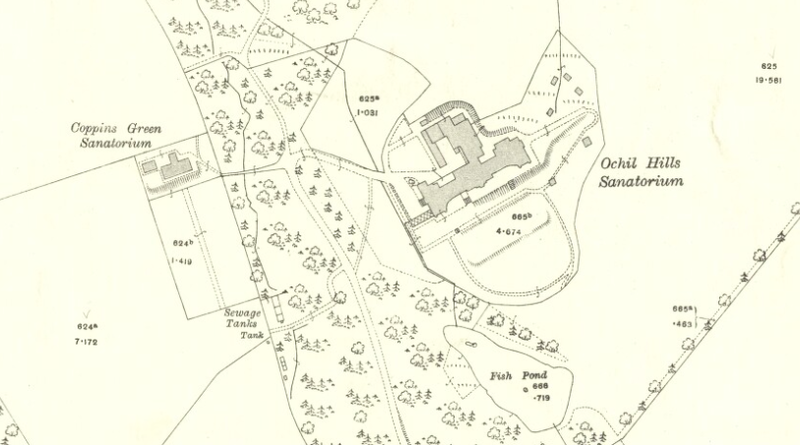 OCHILL HILLS SANATORIUM, MILNATHORT The Sanatorium was formally opened on 16 July 1902. It was a large, impressive three‑storey building designed by Mr Duncan reminiscent of Tor‑na‑Dee in its scale and setting. The Sanatorium catered for the well‑to‑do classes, charging five guineas a week. 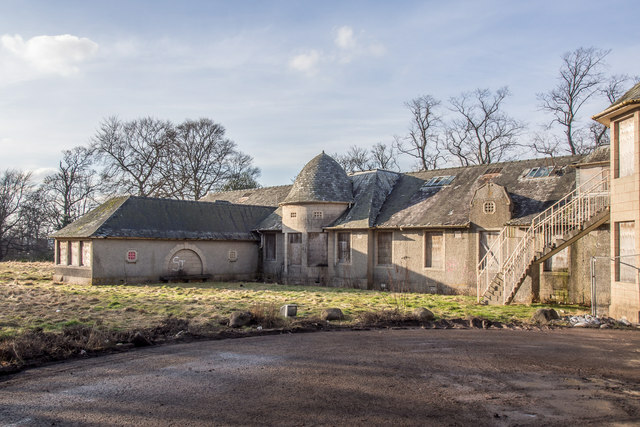 Further pavilions were built in the grounds, to the east, and it became the County Sanatorium for Clackmannan and Stirling, also serving Dunfermline Burgh. There were also a few beds reserved for Glasgow patients. PERTH ROYAL INFIRMARY The present infirmary was built to replace the original hospital (see separate entry) in 1911‑14 to designs by James Miller. In 1907 the Earl of Kinnoull offered the Directors of Perth Royal Infirmary a site for a new Hospital. There had been lengthy arguments amongst the Directors as to whether a new infirmary should be built or the old infirmary reconstructed. 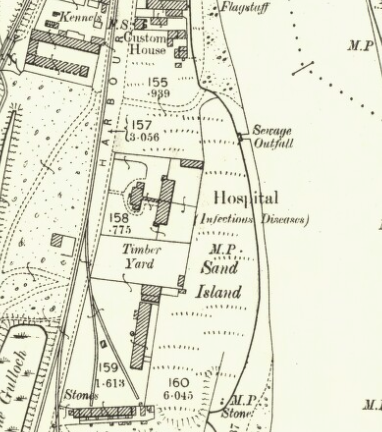 With a new site provided, plans were procured from James Miller for a new hospital containing one hundred and twenty beds and the first sod cut on 15 May 1911. On 26 August the foundation stone was laid and on 10 July 1914 King George V and Queen Mary performed the opening ceremony. Postcard of Perth Royal Infirmary, undated but probably produced around the time that the hospital opened in 1914. In 1927 a maternity block was opened and a nurses’ home was added in 1931. Further medical wards were added in the following year and new operating theatres and a kitchen block were added in 1935‑6. Aerofilms photograph of Perth Royal Infirmary taken in 1932. The new Nurses’ Home is on the left. PERTH ROYAL INFIRMARY (FORMER), GLASGOW ROAD Now Perth County Buildings. The original Perth Infirmary was built in 1836‑8 to designs by W. M. Mackenzie. Though not on the same scale as Grays Hospital in Elgin, the Perth Royal Infirmary had a similar emphasis on form over function in its design. The Greek revival style gives dignity to an impressive public building. Perth Royal Infirmary from the OS large-scale Town Plans, 1860. Reproduced by permission of the National Library of Scotland. A dispensary was established in the early 1830s in Perth in South Street and in January 1834 a public meeting was held to consider establishing a fever and surgical hospital in the city. 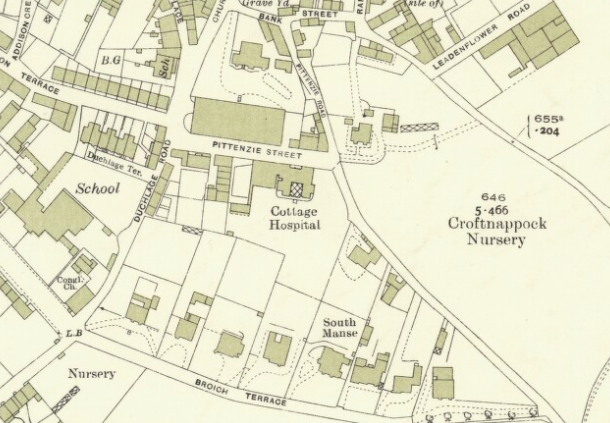 There had been a cholera hospital at Horse Cross and equipment from there was promised to the new venture. Initially the committee considered taking over King James VI hospital but following the gift of 1,000 in 1836, decided to provide a new building. The foundation stone was laid by Lord Kinnaird in 1836 and it opened on 1 October 1838. 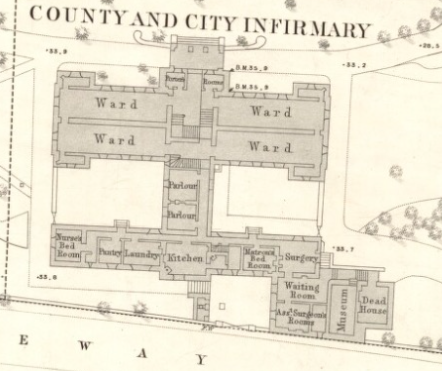 Detail of map OS town plan, showing room arrangements within the infirmary. In 1891 infectious diseases were admitted into the East and West wings. When the new infirmary was built in 1914 the old infirmary was taken over as a Red Cross VAD Hospital. PITLOCHRY COMMUNITY HOSPITAL Opened in 2008 to replace the Irvine Memorial Hospital. It was designed by Edinburgh-based architects Campbell and Arnott and built by Stewart Milne Construction, at a cost of £7m, as a public-private partnership developed by the Medical Centres Group and overseen by NHS Tayside. The building combines a hospital with a general-practitioner surgery (the Atholl Medical Centre), 50-bed care home for the elderly, ambulance depot and district offices for Perth & Kinross Council social work department. 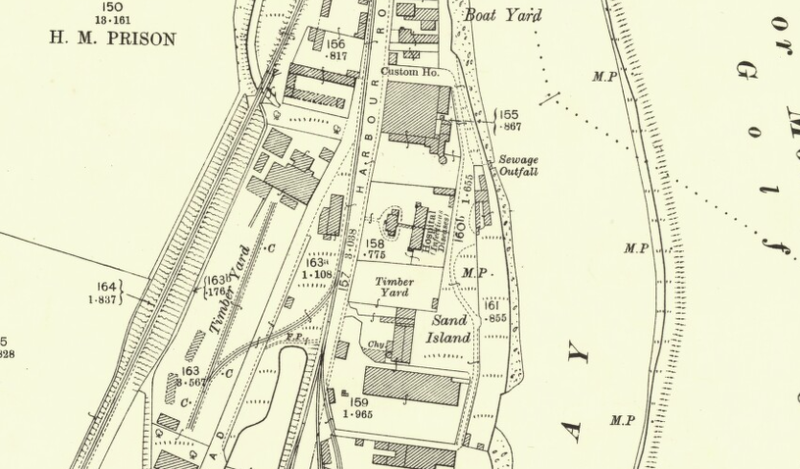 Extract from the second edition, 25-inch OS map, surveyed in 1899. Reproduced by permission of the National Library of Scotland. ROSSLYN HOUSE, PERTH (Council Offices) Rosslyn House was built as the Perth Poorhouse to designs by the local architect Andrew Heiton in 1859. It was just west of the City Infirmary. ST JOHNSTONE’S NURSING HOME, 9-11 BAROSSA PLACE, PERTH The Nursing Home was set up by a Mis Marion Lucy Carphin in 1927, and opened in December that year. A notice in the Dundee Courier ran:’ Miss Carphin begs to announce that her nursing home is now open to receive patients for surgical, medical or maternity treatment.’ It was a private hospital – nursing homes in the 1920s and 30s usually were private hospitals rather than care homes for the elderly as they tend to be today. Originally established at No. 11 Barossa Place, the home later extended into the next-door house of No. 9. 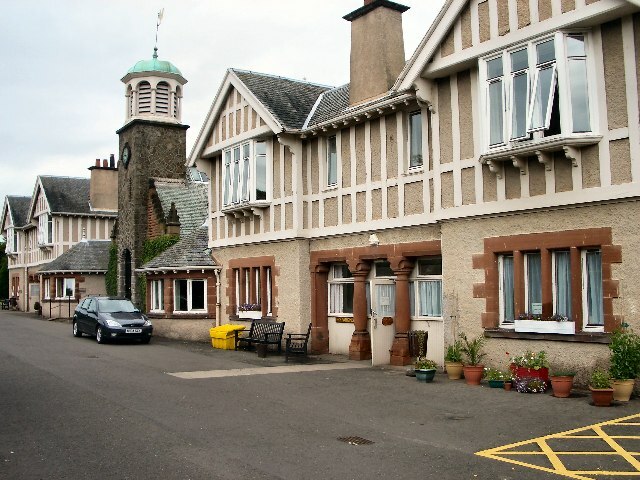 It continued to be St Johnstoun’s Nursing Home right up until 2017, latterly as a home for the elderly, but was sold and planning permission sought for change of use to holiday appartments. ST MARGARET’S HOSPITAL, AUCHTERARDER In 1926 the hospital was built from funds gifted by A. T. Reid of Auchterarder House to designs by Stewart & Paterson. It opened in 1926 as a memorial to Reid’s parents. Main front of St Margaret’s Hospital, photographed in 2017 © David Wotherspoon, all rights reserved. Reproduced by permission of D. Wotherspoon. 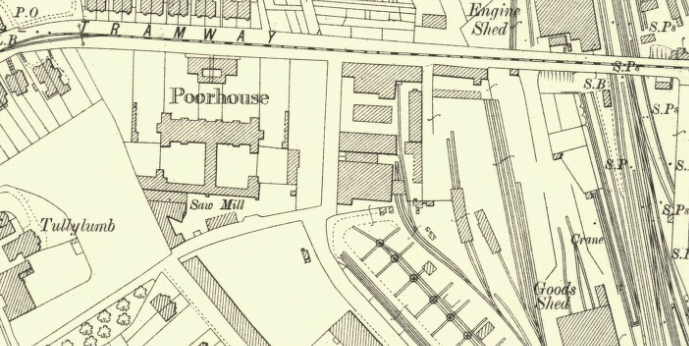 Extract from the second edition, 25-inch OS map, revised 1899. Reproduced by permission of the National Library of Scotland. 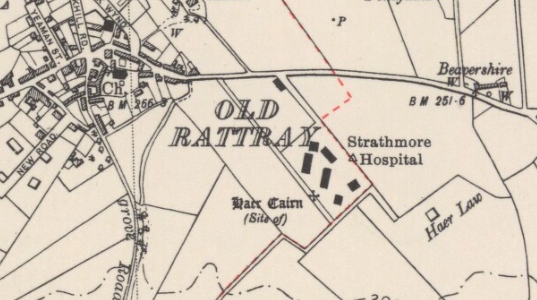 STRATHMORE HOSPITAL, BLAIRGOWRIE Infectious diseases hospital opened on 23 June 1904 to serve a combination of the four burghs in Eastern Perthshire: Alyth, Blairgowrie, Coupar Angus and Rattray. VIEW PARK NURSING HOME, ALYTH Viewfield Villa was purchased by Andrew Cochrane of Craigisla, and James H. Fyfe‑Jamieson of Ruthven, in September 1921. They gave the property to the Alyth, Meigle and District Nursing Association for the purpose of establishing a nursing home or hospital for the benefit of local patients. It was opened by the Dowager Countess of Airlie in October 1922 and took surgical, medical and maternity cases. With the inception of the National Health Service it was used as a maternity home but was closed when the maternity wing at Blairgowrie Cottage Hospital opened in July 1964. It was then converted into a short‑stay home for the mentally handicapped. It was converted back into a large family home by the Building Workshop in 2014 – photographs and plans can be seen on their website. Extract from the first edition, 25-inch OS map, surveyed in 1863. Reproduced by permission of the National Library of Scotland. 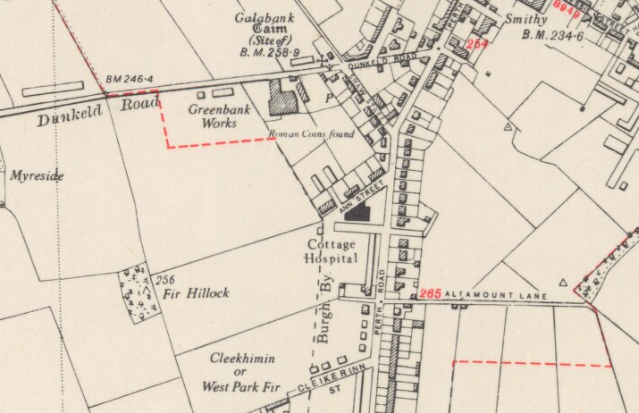 Kinross had a infectious disease hospital (presumably funded by the County of Kinross) on Gallowhill Road to the north west of the town [see close to the base of the sheet, just west of the railway here http://maps.nls.uk/view/82888467 ] The four buildings were timber framed and corrugated steel clad and existed to sometime around the turn of the century when they were finally demolished and replaced by a small housing development site. It ceased to act as a hospital sometime in the 1950’s when in became the Michael Bruce Hostel (a youth hostel named after the celebrated local poet) before becoming private accommodation. Many thanks for this information, and apologies for not acting on it sooner. I have made a brief entry under Perth and Kinross.